To everyone that has been affected by the Kumamoto earthquake I would like to sincerely sympathy. 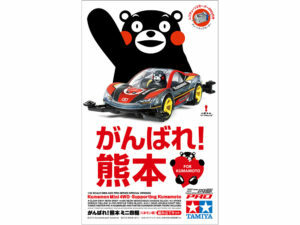 Well, at our company, mini four-wheel drive of special specifications in order to cheer the Kumamoto Prefecture, “Kumamoto mini four-wheel drive (kumamon version) released”, announced to donate the full amount of the benefit in Kumamoto Prefecture beneath it, the total amount is, we will report that to ¥ 7,100,000 (Japanese Yen). This benefit was in 2016 July 15, as a donation remitted to the Kumamoto Prefecture designated account. Thank you for your kind feelings of everyone. Thank you for your cooperation. We pray from the bottom of my heart the earliest possible restoration and reconstruction of the affected areas. This entry was posted in Event Report, Tamiya Company on July 19, 2016 by admin.